College Connections: Are you a freshman interested in joining or learning more about The Poor Richards? Then come join us during orientation on Saturday (8/27) or Sunday (8/28) from 10-12 during college connections for a morning of information and singing. This is a session to ask questions regarding the group and auditions, and to meet with us one on one. All are welcome even if you are unsure about auditioning...we would love to meet with you and answer any of your questions! Event will be held in B11 in the college basement of the College Center. Semester Auditions: The Poor Richards will be holding auditions for new members on Wednesday, Aug 31st (first day of school) and Thursday, Sept 1st from 5-8:30pm. All grades are invited to audition. Auditions will take place in room B11 in the basement of the College Center. Those wishing to audition can sign up at the front desk of the college center. Call-backs will be held on that Friday, Sept 2nd. What to prepare: Please come warmed up and prepared with an excerpt from a song that best displays your voice (no more than a minute). Does not to be memorized and contemporary music is prefered! Auditions will last about ten minutes. Any questions about the audition process can be directed to kstull@fandm.edu. Hope to see you there!!! The start to another fabulous year for PR! What are PR's resolutions? Trilogy Concert feat. PR, Chessmen, and Sweet O! Dipsync: Come out for a night of great lip syncing fun! Emerging Writer's Conference: PR will be teaming up with Henry Wolfe to perform one of his single's! Almanack Concert: It's that time of the year to honor our departing seniors and everything they've done. Autumn Open House: Come hear us perform at the Autumn Open House at 1:00pm in LSP! Tour Oct 15th-20th: The Poor Richards will be going on their annual tour from October 15th-October 20th. Please contact Kathy Stull at kstull@fandm.edu if you would like our schedule. Fall Kick Off Concert: Come celebrate the beginning of Fall and Fall Break Tuesday October 12th at 830pm in the College Center! Junior Open House: Come hear the Poor Richards perform at the Junior Open House at 2:45 in the LSP!!! Family Weekend Concert: Come hear the three a capella groups perform Friday night at the college center at 9pm/Sept 24th during family weekend! College Connections: Are you a freshman interested in joining or learning more about The Poor Richards? Then come join us during orientation on Saturday (8/28) or Sunday (8/29) from 10-12am during college connections for a morning of information, singing, and bagels! This is a session to ask questions regarding the group and auditions, and to meet with us one on one. All are welcome even if you are unsure about auditioning...we would love to meet with you and answer any of your questions! Event will be held in B11 in the college basement of the College Center. Fall Auditions!!!!!!! 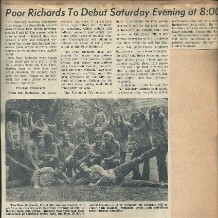 : The Poor Richards will be holding auditions for new members on Wednesday, Sept 1st and Thursday, Sept 2nd from 4:30-8pm. All grades are invited to audition. Auditions will take place in room B11 in the basement of the College Center. Those wishing to audition can sign up at the front desk of the college center. Call-backs will be held on that Friday, Sept 3rd. What to prepare: Please come warmed up and prepared with an excerpt from a song that best displays your voice (no more than a minute). Does not to be memorized and contemporary music is prefered! Auditions will last about ten minutes. Any questions about the audition process can be directed to lilah.thompson@fandm.edu. Hope to see you there!!! 5/1 ALMANACK: Almanack is the Poor Richard's final and cumulative concert of the year. We will be performing every song from the past two semesters as well as debuting a couple of new ones. The event will take place at 8pm in Miller Recital Hall which is located on the second floor in Old Main. There is an admission price of $5 and tickets can be purchased at the door. This concert is also a tribute to our departing seniors so make sure to be there for their last concert! All proceeds go toward the recording and publishing of our CD. 4/9 Relay for Life: Want to do community service and hear some of our songs? Then come out for Relay for Life this Saturday and hear us sing while you walk laps! PR will be performing at 5pm. 4/16 Closer Look: Are you a student who is going to attend F&M or are thinking about it? Well make sure you listen to the Poor Richards perform at this event since you could be one of us in the fall! We will be performing around 3pm. 4/18 Haiti Concert: F&M is putting together a benefit concert for the victims of the Haiti earthquake. We will be performing at this special event along with other musical members of campus. Time is TBA. 4/22 DUWENDE: On Thursday, April 22nd, The Poor Richards are bringing one of the best professional a capella groups to F&M. Duwende, which was created by our very own alumni of Poor Richards, will be performing at 8pm in the college center. This is not an event that you want to miss as they brought down the house last year! Admission is free and PR will be opening up for Duwende so see you there! 4/23 Spring Celebration Dinner: The Poor Richards will be performing at the Spring Celebration Dinner on Friday, April 23rd at 6:30pm. 3/10 TRILOGY: One of our biggest concerts, Trilogy features the Poor Richards, Chessman, and Sweet Ophelia. You don't want to miss it! Concert begins at 9:15 and takes place in the college center. 3/27 Junior Open House: The Poor Richards will be performing at the junior open house in the Life, Sciences & Philosophy Building. Performance is at 3pm. 2/11 Common Hour Performance: Come here Poor Richards, Chessmen, and Sweet Ophelia perform during the common hour at 12pm in the college center! January '10...Happy New Year from PR!!! Spring Semester Auditions: The Poor Richards will be holding auditions for new members at the beginning of the spring semester. Auditions dates are TBA but should be posted on our website soon! Freshmen, sophomores, juniors, and seniors are all invited to audition even if you have auditioned for the group previously. A sign-up sheet will be posted at the front desk of the college atrium and all auditions will be held in B11 in the basement of the college center. Please come warmed up and prepared with a short song that best demonstrates your voice.We look forward to hearing you! 11/20 November/Mozambique Concert: Don't miss out on the Poor Richards November Concert! We will be debuting all of our new songs for the semester and giving out new CD's to those who can answer trivia about our group. In addition this concert is a benefit concert for Mozambique! We will be selling hand-crafted Mozambique bags to give back to their community and there will be a slideshow as well. Concert will take place at 8pm in the college center. Be there! 11/21 Alpha Male: Want to see a PR stud compete for the title of Alpha Male and listen to our sweet tunes as well? Then come to the annual Alpha Male competition, a charity event sponsored by Alpha Phi. Event admission is $2 and location is the College Center. Representing PR is our very own Matt Hrin '10 so make sure to donate some cash money into his jar! Time of our performance TBA!! 11/21 Alpha Male Results: For the first time ever, Poor Richards has won Alpha Male thanks to the studly and talented Matt Hrin! Fans of PR helped to raise well over $200 for charity. Matt also had the help of his lovely back-up performers during his rendition of RESPECT for the talent portion. Thanks to all those donated! 10/2 Family Weekend Concert: On October 2nd, The Poor Richards will be performing with Sweet Ophelia and The Chessman for a joint a capella concert during family weekend. The concert will take place at 9pm in the Steinman College Center. Admission is free and it is a great concert for families to experience the a capella scene on campus. 10/10 Harris Building Dedication: F&M has recently renovated The Harris Building for government and business and is having an offical dedication on Saturday, October 10th. The Poor Richards will help commemorate this special event by singing a few of our songs. Dedication will take place from 11:30-12:30 at The Harris Building. 10/14 Fall Kick-Off Concert: We will be having our first offical concert on Wednesday, October 14th to kick off our fall tour. Come hear some of your favorite PR tunes as well as some new hits we have been working on. Concert will take place at 8pm in the Steinman College Center. Admission is free!!! 10/16-10/20 Fall Tour: Our annual fall tour will take place from Oct. 16th-20th. This year we are taking over New England...stops include singing in the Boston area, The Derryfield School in Manchester, NH, Westminster School in Simsbury, CT as well as The Pennington Prep School in Pennington, NJ. 10/24 Alumni Concert: At 4:30pm in Nevin Chapel, The Poor Richards will perform for their alumni as a part of Homecoming Weekend and for anyone else who wishes to attend! We will offically retire a few of our songs and hear some of our alumni sing their past PR solos. 9/26 Fall Open House Concert: The Poor Richards will be performing at the Fall Open House at 2:45pm on Saturday, September 26 at the Steinman College Center. Fall Auditions: Interested in audtioning? Freshmen, sophomores, juniors and seniors are all invited to audition for the group. Auditions will be held on Sept. 2nd and 3rd from 4:30-8pm. A sign up sheet will be posted on the college atrium desk for those interested. There will also be a call-back after the first round of auditions. All auditions will be held in B11 of the College Center. Please come prepared with a short song that best displays your voice. We prefer a contemporary piece but feel free to choose whatever song you feel best shows off your abilities. College Connections: Are you a freshman interested in joining or learning more about The Poor Richards? Then come join us during orientation on Saturday (8/29) or Sunday (8/30) from 10-12 during college connections for a morning of information and singing. This is a session to ask questions regarding the group and auditions, and to meet with us one on one. All are welcome even if you are unsure about auditioning...we would love to meet with you and answer any of your questions! Event will be held in B11 in the college basement of the College Center.